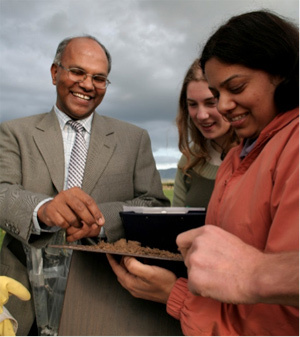 Research on sustainable approaches to maintain soil health is in Professor Nanthi Bolan's DNA. Nanthi has always been passionate about soil because "We know more about the movement of celestial bodies than about the soil under feet" (Leonardo Da Vinci: 1452-1519). It was a case of 'right background, right people' for Nanthi, who came from farming background and graduated from the University of Western Australia under the supervision of two leading soil scientists (Professor Alan Robson and Dr Jim Barrow). That experience was the 'stepping stone' for what has become an illustrious career in soil science with a particular emphasis on soil fertility. He has served as the Dean of Graduate Studies of the University of South Australia and as the leader of the Cooperative Research Centre for Contamination Assessment and Remediation of the Environment (CRC CARE) Programme on Prevention Technologies. His teaching and research interests include agronomic value of manures, fertilisers and soil amendments, soil acidification, nutrient cycling, pesticide and metal pollutants interactions in soils, soil remediation and waste and waste water management. Nanthi has supervised more than 40 postgraduate students, and was awarded the Massey University Research Medal for excellence in supervision. He has published more than 200 papers and was awarded the M.L. Leamy Award in recognition of the most meritorious contribution to soil science. Nanthi is a Fellow of the American Soil Science Society and New Zealand Soil Science Society, and is currently serving as the Associate Editor of Critical Reviews in Environmental Science and Technology. He says 'with continued decline in the land area available for cultivation, food security can be achieved only by safe guarding soil health in terms of its physical, biological and chemical fertility. Nanthi and his research team have been able to identify the causes for the decline in soil health and have also developed innovative methods to improve soil health to achieve food security. As Dr Jonathan Swift once said: "whoever could make two ears of corn, or two blades of grass grown upon a spot of ground where only one grew before would deserve better of mankind". Interested in a PhD in Environmental Remediation?